Complete sound system in a rugged, easily portable case. For audiences up to 1,500 people in a 15,000 sq. ft. area. Rack slots for additional options. Rugged plastic shell hides a complete, 50W sound systems in a lightweight, easy-to-carry package. Combination podium/PA/lectern easily accommodates audiences up to 1,500 people in a 15,000 sq. ft. area. 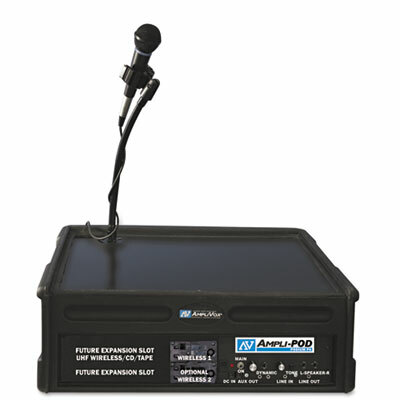 Wireless amp and internal receiver enables more dynamic presentations and audience participation with use of optional wireless microphones (sold separately). Two built-in Jensen design speakers provide 180° of sound coverage. Convenient, easy-to-use controls put microphone and auxiliary controls at your fingertips. Removable speaker grill cover provides easy access to storage compartment for cables and microphones. Two rack slots let you customize your system to meet your needs. Flexible gooseneck mic support with shock mount clip easily adjust to accommodate presenters of all heights. Runs on a built-in 12V rechargeable SLA battery.